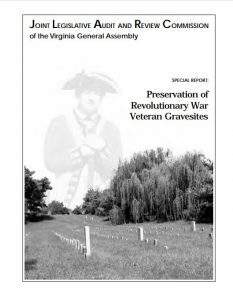 “The Fall 2018 issue of Central Virginia Heritage included three Allen family wills transcribed by Jean L. Cooper. These rare documents go a long way toward illuminating one of Buckingham County’s earliest and largest families who migrated west from New Kent County, Virginia, to Henrico/Goochland/ Albemarle/Buckingham counties during the eighteenth century. “In 1995, Rev. Richard Fenton Wicker, Jr. published a genealogy of this line entitled The Allen Family of England, Virginia, North Carolina, Tennessee, Mississippi, Texas and Illinois, 1600–1995. Over the years, along with many other Allen researchers, I have relied heavily on his solid research. Genealogy, however, is ever evolving and, recently, I learned that some of Rev. Wicker’s conclusions have been disproved based on subsequent findings, including Y-DNA evidence. 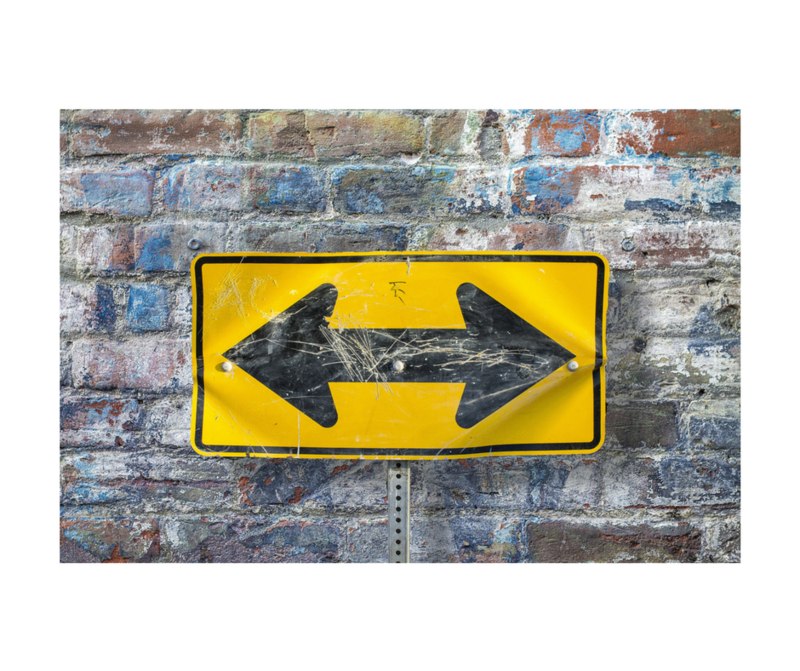 While it is always best to seek primary documents, secondary sources, such as Rev. Wicker’s book, remain useful and his work is fundamental to this article. For those who are not members of CVGA, we offer the opportunity to purchase a printed copy of each issue. The Spring 2019 issue is available from Amazon.com at https://www.amazon.com/Central-Virginia-Heritage-Spring-2019/dp/1798551527 for $6.50. 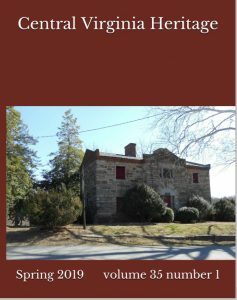 Click on the Amazon.com link above or search for “Central Virginia Heritage” on Amazon.com. 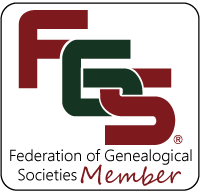 Fairfax, Virginia, January 15, 2019 – The Fairfax Genealogical Society announces its 2019 Annual Spring Conference and Genealogical Expo to be held April 5 and 6, 2019 at the Reston Sheraton Hotel, Reston, VA. The conference (usually attended by several hundred individuals from throughout the Mid-Atlantic regions) will offer genealogists and family researchers (from beginning to advanced levels) the opportunity to hear nationally recognized speakers and consultants in a two-day program of lectures and workshops. Programs featured in this year’s conference include: Beginning and Intermediate DNA Research; Finding and Telling our Hidden Stories; Whiskey, Brandy, and Southern Migration; Researching in Libraries and Archives; African American Research; Colonial Land, Law and Religion; Virginia Research; and other topics. In addition to 40 individual programs, conference attendees may arrange private consultations and browse numerous vendors selling books, maps, CDs, and other items of interest to historians and family researchers. 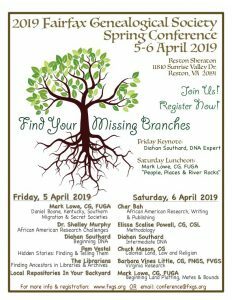 Friday’s keynote speaker will be Diahan Southard, Genetic Genealogy Specialist. Building on her background in microbiology, Southard writes and lectures about genetic genealogy and making the technical understandable. Saturday’s keynote speaker will be Mark Lowe, a professional genealogist specializing in using Southern resources and original records and manuscripts. The conference will run from 9 am to 8 pm on Friday, April 5th and from 9 am to 3:45 pm on Saturday, April 6th. Prior to March 15, fees for Society members are $75 one-day-only attendance, or $90 for both days. Non-members fees are $75 for one-day or $110 for both days. Conference registration can be completed online at the Society’s web page, www.fxgs.org/2019conference. Join us on Saturday, March 9 when we will view a genealogy video by Amy Johnson Crow, “Finding Your Female Ancestors”. After the video we will have a discussion on that topic. RootsTech 2019 takes place at Salt Lake City from Wednesday, February 27 through Saturday, March 2. This is the world’s largest family history event. A few of the sessions are “What’s New on Family Search”, “Connecting Your DNA Matches”, “Becoming a Professional Genealogist”, “What You Don’t Know About Ancestry”, and “The Research Roadmap: Your Path to Success”. NOTE: We will not be meeting in April. We are encouraging members to attend the VGS Spring Conference which falls on the second Saturday of April. The meeting will take place. One difference: rather than entering the church at the back near the Family History Center, we will continue on around the church and enter at the far end, closer to Airport Road. Once you are in the building, turn to the left and continue down the hall. Bring your genealogy questions to our February meeting and we will put our heads together to help find possible avenues of research. We will save some time to hear about your recent discoveries and successes in your genealogy. 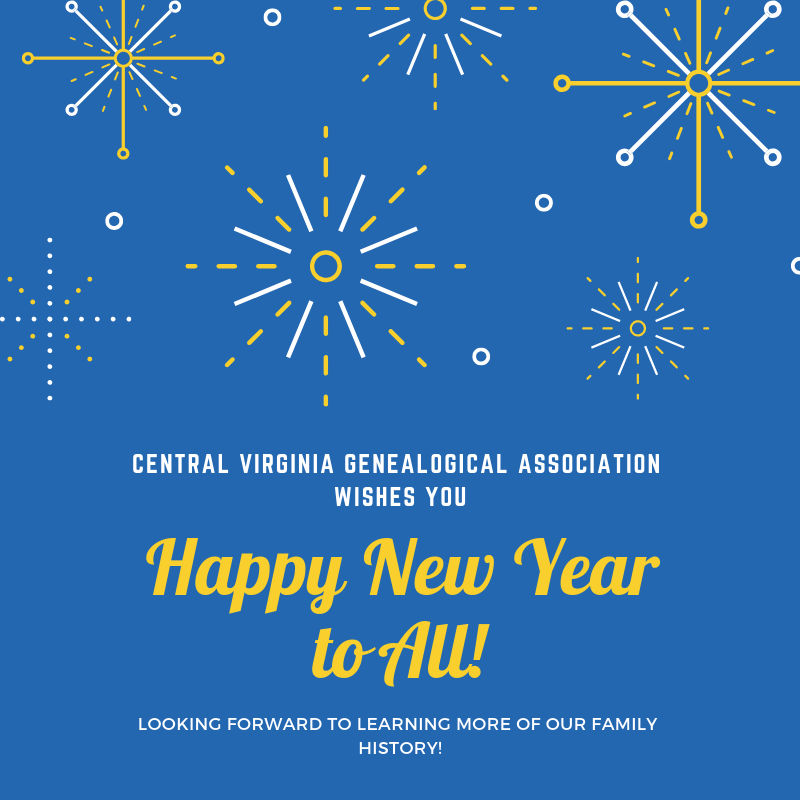 Come and be inspired to launch your genealogy research in 2019! The meeting will take place Saturday, February 9 from 1:30 pm-3:30 pm at the Church of Jesus Christ of Latter Day Saints. The address of the Church is 1275 Timberwood Blvd., Charlottesville, VA. It is located on the corner of Airport Road and Timberwood. Coming from U.S. 29, the entrance is on the right (north) side of Airport Road immediately before you reach the church. Drive to the back of the building where you will see the entrance to the Family History Center. The weather forecast is calling for snow this weekend so we have cancelled the Saturday meeting. Stay safely at home and enjoy the snow! Let’s start out on the right foot in 2019! Bring your genealogy questions to our January meeting and we will put our heads together to help find possible avenues of research. We will save some time to hear about your recent discoveries and successes in your genealogy. Come and be inspired to launch your genealogy research in 2019! The meeting will take place Saturday, January 12 from 1:30 pm-3:30 pm at the Church of Jesus Christ of Latter Day Saints. The address of the Church is 1275 Timberwood Blvd., Charlottesville, VA. It is located on the corner of Airport Road and Timberwood. Coming from U.S. 29, the entrance is on the right (north) side of Airport Road immediately before you reach the church. Drive to the back of the building where you will see the entrance to the Family History Center. 29 Mar 1893—Mr. James C. Bishop and Miss Carrie L. Dudley were married at the residence of the bride’s parents near B. M. church last evening, the Rev. George F. Cook officiating. For those who are not members, we offer the opportunity to purchase a printed copy of each issue. 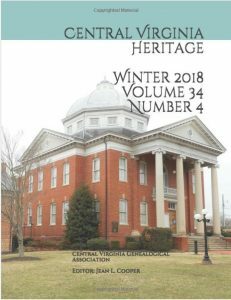 The Winter 2018 issue is available from Amazon.com at https://www.amazon.com/Central-Virginia-Heritage-Winter-2018/dp/1723823627 for $6.50. Click on the Amazon.com link above or search for “Central Virginia Heritage” on Amazon.com.